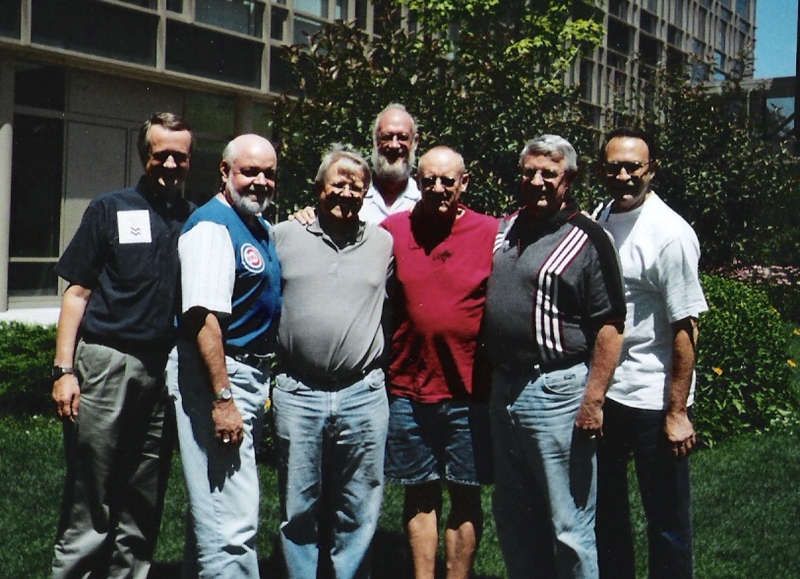 Dale Hartwig (red shirt) and the Chicago Seven Gathering, McCormick Theological Seminary, 2004. This morning news arrived of the passing of an old friend. Dale is a classmate, one of seven who call ourselves The Chicago Seven. The Seven met annually until 2004 when the gathering was reduced to Six because of Dale’s advancing Parkinson’s. The gatherings have continued to be powerful bonds of friendship, but never again so meaningful as when there were Seven. Dale was such a joy for all of the Chicago Seven (now Six). His quiet spirituality brought a stillness to the room, or tears, and so much reality and the tenderness of a poet. The last time all seven of us McCormick alums gathered in Chicago, we sat around a long table sharing our thoughts and work. Dale and I were sitting next to each other, as we often did, at one end of the table. When it came his turn, Dale moved some papers in front of me and asked that his words be read. His contribution, as I recall it, was a Greek exegesis from a New Testament text that reminded us of his love for biblical exegesis, he being the only one of us who left seminary to become more proficient in NT Greek than when we left. His sharing also included a poem he had written. As I read it aloud on his behalf – his surrogate voice – he began to weep because his words had been heard! Here’s the poem in memory of that sacred Hartwig moment – one of many – that the rest of us will forever cherish. all but sobs too deep for words. in poetic verse the ventriloquist’s voice has penned. except from him, their author. to tears of comrade joy. pardoned from the voiceless hell. the chains of sadness snap and break! re-Voice unbroken chords of brotherhood. This entry was posted in Life, Memoir, Poetry, Religion, story, Theology, Uncategorized and tagged chains of sadness snap and break, Chicago Seven, Dale Hartwig, Gordon C. Stewart, Memorial tribute, pardoned from the voiceless hell, Parkinson's, Primal depths, surrogate voice, the abyss, the abyss of muted isolation, The surrogate by Gordon C. Stewart. Bookmark the permalink. What a tribute, Gordon. He may now be missing in body from your group of seven, but never in spirit. It will always be there when the rest of you meet. Blessings and comfort! Thanks, Karin. He’s been with us by his absence since his last trip in 2004. He served only one church and became the chaplain to the whole town of Concord, Michigan. I think the poem of thanksgiving is truly beautifully stated. I also think served only one paish; am I corrrect about that? Jim, Yes. His whole ministry was in the one congregation in Concord, MI. He was probably the only of us good enough to last all those years in one place! He loved them. They loved him. Gordon, thank you for the note of Dale’s death. He was one of our most esteemed fellow students. Great memories still remain. I, who never was a ball player, broke two ribs while stumbling after a ground ball. Dale took me to the hospital and stayed until the X-rays were developed, ribs taped and then drove me back to the Seminary. Just a small memory which always reminded me of how much Dale was a giving. Soul. Peace goes With him into the presence of God. Hi Jim. Wayne and Vicki Boulton will be at the Memorial Service at the United Methodist Church in Concord, MI this Sunday at 2:00 p.m. It’s held there rather than First Pres. because First Pres. isn’t large enough to accommodate the expected crowd. What a great memory you share here. Please share this with Wayne between now and Sunday! Grace and Peace. Gordon, I’m sorry for the loss of such an inspiring person in your life. Thanks for sharing his moving poem. Gary, he really was one-of-a-kind. He served only ONE congregation. Never bit on the career ladder nonsense. His was a ministry in a small church (First Presbyterian) in the small town of Concord, MI. As Jim Gardiner’s comment informs other readers, Dale was a pastor before he was a Pastor – he just cared about people and went out of his way to help with an easy gracefulness that didn’t draw attention to himself. He was a superb athlete, an agile quarterback who took command of his team not by barking but by winning their respect. He was poet, an artist, a photographer. So much more. Thanks, Gary. Thanks, Gordon, for allowing us to share not only your grief, but the taste and feel of wonderful, deep, enduring friendship. My throat is constricted with sympathetic tears.